During the past 50 years, medical organizations' quality management systems (QMS) haven't kept pace with their organizations' increasing complexity. Such a gap would be impossible in the manufacturing sector, where organized factories began to displace skilled individual craft workers as early as the middle of the 19th century. Subdivision of labor required and promoted the evolution of inspection, quality control and, most recently, ISO 9001 and ISO/TS 16949. In contrast, the physician's little black bag symbolized the typical medical "system" through the mid-20th century. (5) Every effort must be made to reduce and eliminate medical errors by identifying problems and implementing solutions that promote patient safety. (7) The costs of medical malpractice insurance premiums are directly impacted by medical errors. (8) Health care providers' cost of poor quality is estimated to be as high as 30 percent to 50 percent of the total amount paid for health care. (9) A 1999 study by the Institute of Medicine at Harvard University revealed that, each year, as many as 98,000 people die as a result of preventable medical errors.... The study cites medical errors as the fifth-leading cause of death in the United States. (10) Research shows that a vast majority of medical errors are systemic rather than human errors. (11) Total quality management systems implemented in industry and, recently, by the U.S. Department of Veterans Affairs hospital system have successfully reduced medical errors. (12) It is the purpose of this act to improve patient safety, improve health care quality and lower health care costs by offering medical malpractice premium discounts to health care providers that institute total quality management health care systems. Doctors complain that rising malpractice insurance rates are driving them out of business, but they're making little effort to educate themselves on the role of quality systems in preventing malpractice. The characteristics that come to mind when most people think of malpractice are human negligence or incompetence. But those make up only about 15 percent of any activity's trouble. The balance, 85 percent, comes from deficiencies in the system in which people work. The industrial world had to go through a major paradigm shift during the mid-19th century, when subdivision of labor made it impossible for any individual worker to control the quality of a complex process. Factory managers began to address the complexity of their processes by adding quality inspectors to screen out defective products. Scientific management and motion efficiency arrived on the scene at the beginning of the 20th century, when Frank Gilbreth and Frederick Winslow Taylor pointed out that even jobs that were done properly might also be done inefficiently. Henry Ford later used lean manufacturing in error-proofing and self-check systems that kept defects from occurring in the first place. However, even from 1910 through the 1920s--during Ford Motor Co.'s rise to dominance--the doctor with his little black bag constituted the most common health care "system." In contrast to factory workers who performed only a couple of tasks in immensely complicated processes, doctors still had total control over their patients' diagnoses and treatments, so very little could go wrong. The physician was often a self-contained system even during the 1950s, but today's doctors are at the mercy of processes over which they have no control. For example, a prescription must pass through several hands before it gets to the patient. A surgeon controls his or her own sterility but not that of the surgical assistants or the operating room itself. If a patient receives the wrong medication or suffers a post-operative infection, the doctor is probably the first to be sued even if he or she did absolutely nothing wrong. Yet many doctors refuse to acknowledge that they are just one part of a system and take offense at the idea of working under quality "controls." Henry Ford foresaw the need to apply an industrial-style QMS to health care more than 80 years ago when he wrote, "The same kind of management which permits a factory to give the fullest service will permit a hospital to give the fullest service, and at a price so low as to be within the reach of everyone." (Henry Ford and Samuel Crowther, My Life and Work, Doubleday, Page & Co., 1922.) The Henry and Clara Ford Hospital was eminently successful in providing inexpensive state-of-the-art health care. Having several doctors examine the patient and render independent diagnoses was the norm. Unfortunately, Ford's systems perspective wasn't adopted throughout the health care industry as its complexity expanded in subsequent decades. Excessive health care costs and rising malpractice insurance premiums have an identical root cause: quality management systems that can't prevent waste and medical errors in complex medical processes. 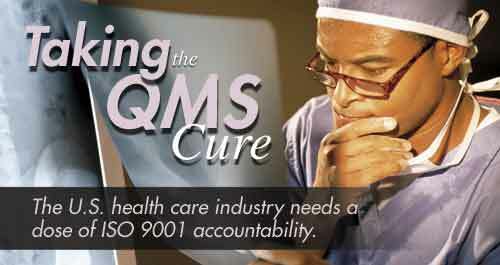 ISO 9001 is an off-the-shelf solution to this issue, but the problem remains of persuading--or compelling--hospitals and other health care providers to meet its requirements. The Automotive Industry Action Group, the American Society for Quality's Healthcare Division, the Standards Council of Canada and the Canadian Standards Association have tailored ISO 9001 to health care through the International Workshop Agreement 1 modification. Only a handful of hospitals in the United States, however, are registered to ISO 9001. This is regrettable because ISO 9001-compliant systems can easily prevent most malpractice while attacking the 30-percent to 60-percent cost of poor quality that's endemic in health care systems. Prescription errors that kill up to 25,000 people a year are one problem that ISO 9001-compliant systems could virtually eradicate. ("Message to Physicians: Better Read than Dead," Wilkes-Barre Times Leader, October 25, 2000.) We're more careful with money than the health care system is with medications; we write out dollar amounts on checks to make sure there's no mistake, but doctors still scribble numbers and abbreviations on prescription pads. The Leapfrog Group advocates computer physician entry order (CPEO) systems, which "ensures that prescribers enter hospital medication orders via a computer system that includes decision support software to reduce prescribing errors." (See www.leapfroggroup.org/for_hospitals/quality_safety_practices.) A CPEO can check the medication for dosage errors (e.g., 10 mg instead of 1.0 mg) and dangerous interactions with other drugs. Industrial data-collection systems perform similar checks routinely; for example, they'll ask an operator who enters "100 mils" for a process whose specification is normally 10 mils whether this is indeed the correct number. There's no excuse for not deploying similar self-check and error-proofing methods to life-critical health care activities. • Identify the root cause. • Implement a permanent solution. • Make the new method the standard for the process in question--e.g., by updating work instructions and procedures. • Share the experience and the permanent solution with other hospitals. In fact, the health care provider doesn't have to wait for a mistake to happen before using the closed-loop corrective action system. A nurse, for example, who catches him- or herself before giving a patient the wrong medication should be encouraged to report the near-miss. Again, the focus shouldn't be on disciplining the nurse (which would only encourage him or her to hide future near-misses) but on understanding the system-related problem that might have allowed the wrong medication to be dispensed. Suppose, for example, that the nurse reports that vials of different drugs look almost identical, and he or she picked up the wrong one by mistake. The nurse might recommend using distinctive labels or, even better, scanning the vial with a portable barcode scanner and then scanning the patient's wristband to make sure that the two go together. Self-reporting near-misses is common practice in Japan; the vehicle for doing this is known as a hiyari ("scare report"). If it was used routinely in U.S. hospitals, doctors would find themselves spending far less time in court, as the next section will show. • Two nurses who treated the patient weren't certified in a pediatric life-support course, even though their job description required it, and the emergency room physician wasn't certified in emergency room medicine. Nurses in the pediatric unit didn't know how to read a cardiac monitor. ISO 9001 requires that an organization identify the requirements of each job and verify that each person assigned to a task is qualified to perform it. • The hospital failed to record the patient's weight, which might have shown that he wasn't getting adequate fluids. ISO 9001 requires an organization to have a mechanism for ensuring that products (or patients) receive all necessary tests and measurements, that the results are recorded and that corrective action is taken if they're out of specification. The reported testimony revealed other problems as well. It's important to realize, however, that most catastrophic accidents require more than one element to go wrong. An ISO 9001-compliant QMS might not have prevented all the problems, but it probably wouldn't have had to in order to save this patient's life. If, for example, the problem with fluids had been detected, it might have led the care providers to the life-threatening problem in time. Mixed-up test results also killed Jeanella Aranda and subjected her father to unnecessary surgery as an organ donor. "The lawsuit alleges that doctors mistakenly gave Jeanella Aranda a liver transplant from her father instead of from her mother. The mother and child had type O blood; the father is type A." (See www.cbsnews.com/stories/2003/03/13/health/main543814.shtml.) An even more infamous case occurred when a woman was killed and two sets of transplant organs were wasted because she was given a heart-lung set of the wrong blood type. This also probably cost the life of another patient who could have been saved by the first organ set. Such catastrophes are almost impossible under ISO 9001-compliant systems because the standard has very strict requirements for product (or in this case, patient) traceability. Parts in factories rarely get the wrong process recipes, and the same applies to mix-ups in test results and other quality records. If factories apply state-of-the-art product traceability and data-integrity assurance techniques to inanimate products to avoid wasting money, there's no excuse for wasting human lives by not using the same methods in health care. ISO 9001, and especially its IWA 1 modification, is an off-the-shelf solution to the U.S. health care crisis. Given that 30 to 60 cents of every health care dollar is squandered on inefficiencies, it's clear that ISO 9001-compliant quality systems would benefit every stakeholder in the nation's health care system--except perhaps trial lawyers, who will have far fewer malpractice cases to try. There's no excuse for further delay in implementing ISO 9001 across the health care industry.